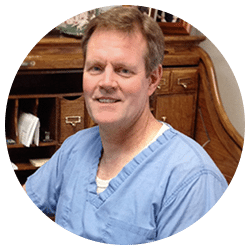 After graduating high school in 1977, Dr. Davis attended school here in Atlanta to become a Dental Technician and graduated from this two year program first in his class. He next attended The University of Pittsburgh/ Eye & Ear Hospital to study Maxillofacial Technology, being one of the three selected to attend the one-year program. He then entered college at Georgia State University and three years later was accepted to Dental School at the Medical College of Georgia. He graduated from the four-year dental program in just three years, being the first to ever graduate early and finished second in his class. He stayed on at MCG for an additional two years to do a residency in Prosthodontics and become a specialist. He then went on to another one-year residency at Roswell Park Cancer Institute in Buffalo, New York, to become a Maxillofacial Prosthodontist in 1991. In addition to Dentistry, Dr. Davis has many interests including sports and coaching. He has been coaching wrestling at Stockbridge High School since 2003. He is a member of the Church of Jesus Christ of Latter Day Saints and has a wife and four children. It is our goal to bring all patients to the awareness that they do not have to live in discomfort with problems of the mouth or otherwise. We deliver only the highest quality of personalized care in restoring you to a state of optimum health. Furthermore, we desire to educate all patients as to the importance of their becoming “Partners in Care” with us, in order to maintain optimum health once acheived.